For many young people across sub-Saharan Africa, work—whether paid or unpaid—is a fundamental element of everyday life. 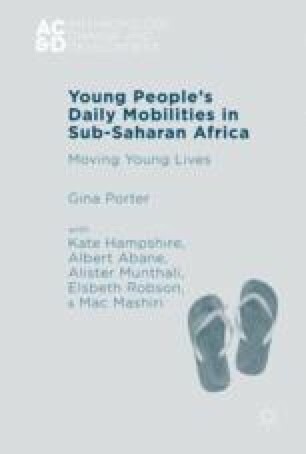 This chapter encompasses not only work activities that require mobility to reach or conduct work but also work activities that are specifically generated by Africa’s transport failures (the need to carry water in the absence of water pipes, fuel in the absence of electricity, food and other goods in the absence of cheap motorised transport). The costs and constraints of mobility, compliance and resistance are examined in rural and urban locations. This includes specific reflections on children’s bodily experiences of load carrying, drawing on the work of Goffman, Bourdieu and others, in order to examine the findings in terms of gender habitus, performance and institutional reflexivity—the way gender is embodied from an early age through reiterated practices.